This blank unpainted wooden shield measures about 25 inches in diameter. The shield is made out of a 0.5 inch thick smooth composite wood, which is considerably stronger and more durable than plywood. Two braces are attached to the back, as shown. The shield has also been completely sanded and is ready to take into battle or ready for you to paint with a design of your own! 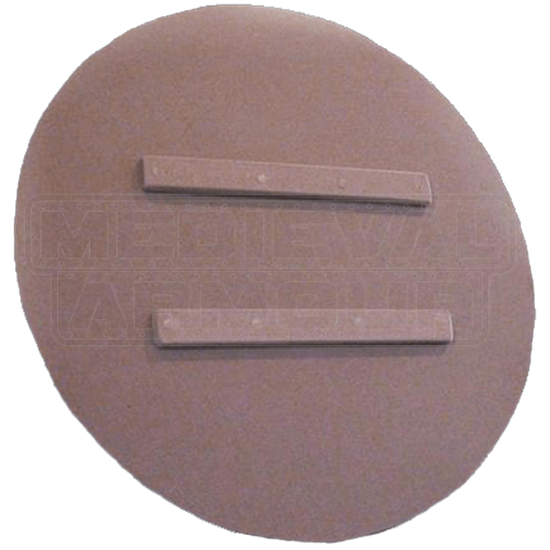 The Wooden Blank Unpainted Shield would be perfect for upcoming Renaissance fairs, theatrical productions, or medieval reenactments. This wooden shield would also make a great gift for any Renaissance enthusiast you know. Great shield. Prompt delivery. Takes paint very well. Will need some sanding. Expect some very minor wavy-ness in the outer circular edge but nothing you could notice without a very close inspection.